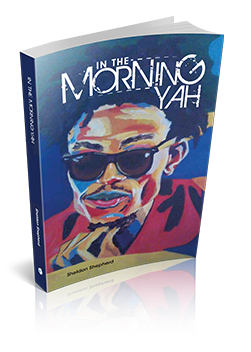 In the Morning Yah is a masterful compilation of 52 amazing dub poems and 12 fantastic pieces of art (paintings and drawings) with interpretation based on the poems they accompany. Declaring his place in his uber talented singing group, Nomaddz – Sheldon Shepherd proves that he has talents that lay beyond just his musical gifts. Sheldon Shepherd is a lead singer in the ecletic and highly artistic bongo boy band No-Maddz. As the 'Returning Resident' he adds panache and elegance...with vocals to die for. His history in writing and performing dub poetry far outstrips his performances with the bongo band however, as he has been winning gold from Jamaica's largest and most enduring cultural talent organizers: The Jamaica Cultural Development Commission. His performances have taken him to worldwide. He now shares some of his most amazing pieces with you. His talent is genetic however, as his father Keith Shepherd is also a prolific dub poet.